Your kids are in for a treat! Don’t miss the fun of unboxing children's’ books and worksheets! 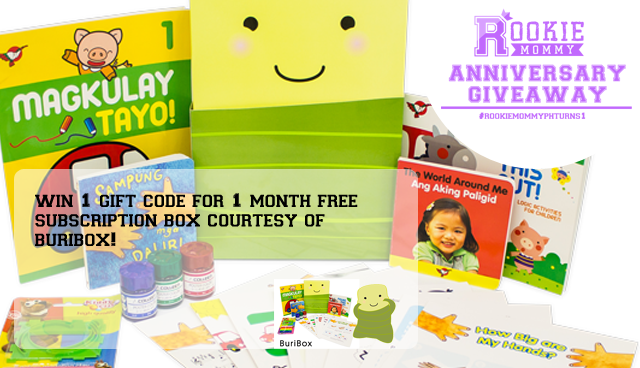 Join the #RookieMommyPHTurns1 Blog Anniversary Giveaway and win one (1) Gift Code for a month of FREE subscription box of BuriBox courtesy of BuriBox Philippines. BuriBox, Adarna House's new subscription product, delivers books, activities/worksheets, and art materials straight to your home every month for just P799 per month (inclusive of delivery in Metro Manila). Created specially for the Filipino child, each BuriBox has been carefully crafted and curated by expert educators and product developers. BuriBox comes in two packages: Toddler BuriBox (recommended for children 3-5 years old) and Young Reader BuriBox (recommended for children 6-8 years old). SHARE this blog post on your Facebook with your own caption and TAG 3 mommy friends with the hashtags: #RookieMommyPHTurns1 #BuriBoxPH #YesToReadingYoung - DO NOT FORGET TO SET YOUR POST ON PUBLIC. 20 comments on "#RookieMommyPHTurns1 Blog Anniversary Giveaway: BuriBox"
We can’t wait to get our first BuriBox set! “We can’t wait to get our first BuriBox set! https://m.facebook.com/story.php?story_fbid=10203733054805457&id=1790834139&ref=bookmarks , Rizelle Anne C. Galvez and rizcaparasgalvez@gmail.com"
“We can’t wait to get our first BuriBox set! We can't wait to get our first BuriBox set! Sorry, I'm a li'l bit confused, don't know where to post my photo. So I posted my photo on IG and FB too..